So some basic facts known by Faraday but left out of my education! The diamagnetic response is fundamental. If object repel each other in the presence of a magnetic field, that is a rotating vortex of forces and this is not affected by temperature or the underlying heat pressure what does that tell us about induction? Paramagnetism shows an increase in induction as does ferro magnetism but both are sensitive to heat pressure. These vortices show a quantitative increase in induction over a diamagnetic resistance. How are these same materials electrostatically? Now it seems that there re 2 fundamental magnetic substances from which all other magnetic substances evolve! 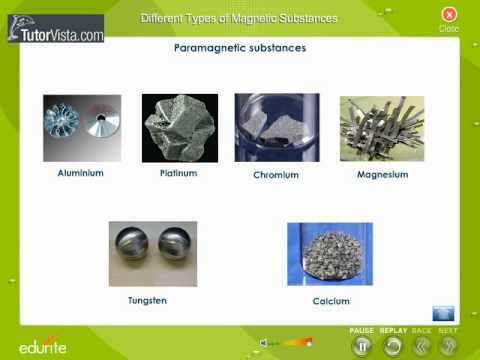 Diamagnetic substance and paramagnetic substance! This one contains a picture of a magnetic domain boundary altering under a magnetic field being applied. What interest me is tha fluid like change . The supposed electrons are not in your face! •Diamagnetism is similar to electrostatic polarization of a dielectric in that the induced magnetic moment tends to oppose the field that creates it. Earnshaws theorem means that magnetic and electric surfaces cannot be still! Therefore both electrostatic and magnetostatics are a nonsense. There has to be continual motion in these situations, making it very likely that they are the same force fields in vorticular motion! So when Oersted noticed his magnetic compass move, did nobody check out an electrostatic compass? See top video. This lecture nicely outlines the pragmatics of explaining phenomenon, and the skepticism one should have about" science". Earnshaw's theorem indeed means electric and magnetic vortices swirl near the surfaces of objects,, particularly at so called equipotentials.mbut this theorem applies only as long as a inverse square law is maintained. And an inverse square law is not a universal regional law! Laws change from region to region. The thing to note in this video is the flickering vorticular movement of the test piece. What this is demonstrating is there is no such thing as a static electric field. Making the point starkly clear: electric and magneti fields are historically misnamed a vortex exists around the poles of materials which is fluid in nature. 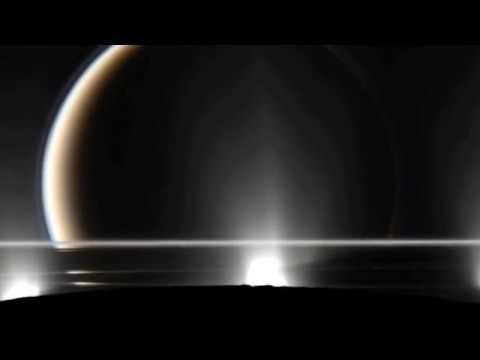 Depending on the vortex generating material and the vortex responding material we observe varying phenomena. The extremes of these phenomena are always at right angles to each other, but in a spherical reference frame. Thus we have called radial phenomenon electric and tangential to a surface phenomenon magnetic. In the full picture they are components of a vorticular fluid dynamic. Observing a magnet under diamagnetic levitation I noticed it did not spin. Thus, if a vortex is responsible for the observable behaviour , and in particular a fluid vortex, this behaviour has to be accounted for. The spin of a vortex is consistently attended by a spatial structure of a high pressure region swirling around a low pressure region. The low pressure region translates as a body in the opposing direction to the bodily translation of the high pressure, but to an external observer the handedness of the vortex screws are opposite. However the pitch of the screws and the slope of the pitch are identical but the translation is reflected, it is taught. There is a fundamental problem with the handedness description. It reduces eight possible motions to 4. To describe the possibilities we use a screw thread which complicates the description further due to reaction forces. 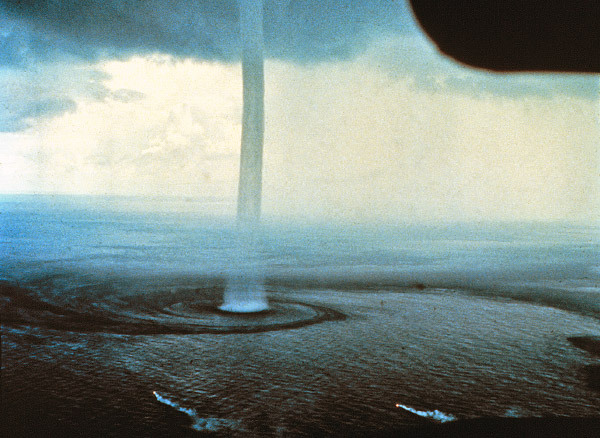 The observation of a water spout shows the natural Spaciometry of the tornadic vortex. The high pressure spirals down and inwards, the low pressure spirals out and upwards. The handedness of the screw is an additional factor which increases the possibility to 8 patterns of motion. If we block this out we can then make better observations than just using the left or right hand rule. The block consist of observations by an external observer . The form has its local reference frame and the observer sets the external reference frame relative to his own subjective processing. Firstly the observer determines clockwise and anti clock wise in his frame. He then determines the orientation of the forms local frame in his reference frame. In this scenario the observer may not move! If the observer wishes to move an alternative ,external reference frame structure will have to be employed requiring a dual relative, or in other words a relative pair of reference frames in addition to the forms local reference frame. Why? Because a single reference frame assumes we can physically get to every point referenced in order to read off its measurement. We cannot. We can only read measurements in our own local subjective reference frame. Thus trigonometry was discovered and exploited and developed, and and this is why the sine ratios and Pythagoras theorem are fundamental to our Spaciometry. Clockwise is in fact not a single determination. It is orientation dependent. Also, for a moving local reference frame in the observers frame clockwise involves a logical flip for an observer. This can be seen easily by rotating a circle or disc clockwise and then rotating it's axis of rotation as if it was a radius of a circle, as in the case of a gyroscope. Using the gyroscope as an analogy, it can freely translate in any direction providing its axis is not rotated. Thus a gyroscope is set spinning relative to its local reference frame, which remains fixed in the observers reference frame. Thus the local reference frame of the gyroscope is used to define clockwise regardless of the local frames orientation in the observers frame . We agree that clockwise is a local frame description not an observer frame description. We thereby invalidate the left and right hand rules! However they are only a rule of thumb! Returning to the vortex we therefore use a gyroscope to model the local frame of reference. Referring to the gyroscope the downward moving pressure is high and circulating say in the way of the gyroscope. The high pressure is also circulating inwards toward the axis of the gyroscope. The question now is what is the low pressure region doing? We know it is translating upward. Is it spinning as per the gyroscope or in the opposing spin? Is it also spinning inward toward the axis or outward from the axis? The Venturi pinch in the image above indicates a faster updraft velocity, and the mist or spray seems to be filamented vortices. Their gyroscopic spin and internal motion can be guessed at in that case . Their gyroscope may be anti, but their direction to ward the axis is likely due to vortices forming around low pressures. However we do get vortices forming around high pressure cells. This tornadic example is only one possible structure, but what we may observe is high pressure inwardly spiralling mass moving downwards . This defines the local gyroscopy. Then in the centre a low pressure fast moving upward reflection of this gyroscopy is fractally filamented. These filaments as a system have the opposing spin gyroscopy in a wall that is a homeostatic layer of equilibrium. Thus the lowest pressure in the system is not at the centre of the low pressure but rather just in the wall ! This wall acts like a thin film lubricant between 2 gyroscopes with opposite spin and the same (collinear or parallel) axis /axes. but one part spins inwards while the other spins outward. The wall forms a vorticularly filamented structure. that is a system of vortices which apparently have the same gyroscope but move away and upward in the wall with a structural relative opposing spin, that is like the spin of the internal mass. This 3 part structure has 2 gyroscopes with the same axis with an opposing axial translation, an opposing radial motion in the 2 main masses with a third wall layer that has the same axis, the same upward axial translation but an opposing radial translation as the central mass. If you found that difficult. do not worry, there are 7 more possibilities to consider! Back to the magnets. In this equilibrium system therefore the net relative motion is not a spin if the top and bottom of the vortices represent boundaries that sustain a force reaction that pushes them apart! The greater mass of inwardly moving mass clearly pushes down and out ward in the image above creating a complex wave pattern around the clear wave ridges marking the vortex swirl. This ridge provides additional information that possibly a very thin wall of low pressure vortices rides outward along the top of the ridge lubricating the inward flow. These would be similar to the wall vortices but not as powerful. In this description i have not mentioned the clear difference in power and kinetic or potential energy in these vortices, i have just drawn attention to the Venturi effect as an indication. My guess is that this system represents a net repulsion system as in the diamagnetic case. one of the 7 other possibilities will have to represent the paramagnetic behaviour . which one it is i would like to observe empirically. 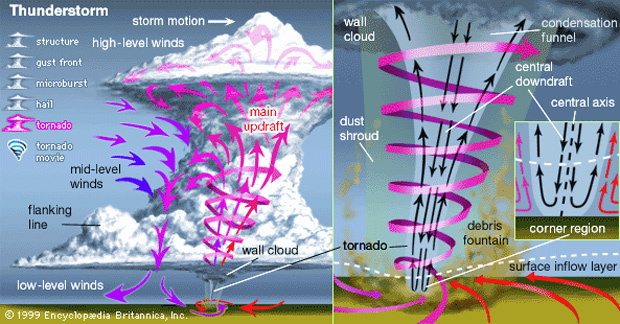 This is where the Thunderstorm cloud structure diagram comes from. With this additional information i posit that the magnet remains stationary because the inner rotating mass at the vortex centre matches the lower magnets own gyroscopic vortes axially and radially. thus countercting the external masses rotational effect on the magnet, If this is the case then an opposing gyroscopic spin in the magnet along the same axis should rotate it with th external mass leading to an increasing acceleration. Another misconception we have to avoid is that of warm air rising! The more general Archimedian principle is different densities do not mix. Under a driving force field they will separate out. Thus diffusion separation, gas and mass chromatography , ink lot chromatography and electrolytic chromatography are all examples of the same principle that floats a boat, flies a plane and makes your bath water rise when you get in it. Different density displacement is enhanced when one density has a strong boundary layer as a barrier. But of course osmosis may occur at that boundary as equilibria states are sought and established. My question was are magnetic flux and electric fields orthogonal? The answer appears to be no! According to the special theory of relativity, the partition of the electromagnetic force into separate electric and magnetic components is not fundamental, but varies with the observational frame of reference: An electric force perceived by one observer may be perceived by another (in a different frame of reference) as a magnetic force, or a mixture of electric and magnetic forces. Formally, special relativity combines the electric and magnetic fields into a rank-2 tensor, called the electromagnetic tensor. Changing reference frames mixes these components. This is analogous to the way that special relativity mixes space and time into spacetime, and mass, momentum and energy into four-momentum. This " standard" of electromagnetic theory as taught at A level is a misconception hidden from further scrutiny unless you study highly mathematical texts. 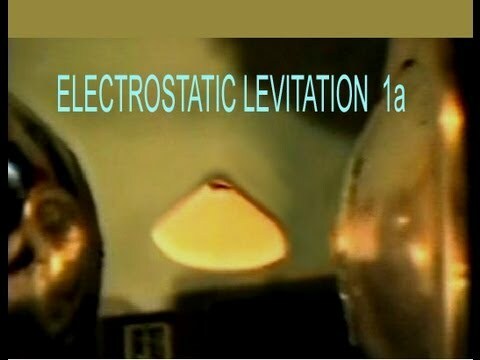 So called magnetic and electric fields may be aligned. What is being described as orthogonal is the force of interaction between charges moving in the fields. Stop and think for a while! This is confusing because it is overly mathematical. 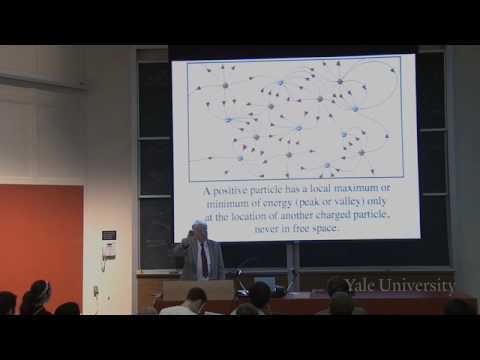 It does not matter if a supposed particle moves in a supposed field orthogonally. The actual movement phenomenon of a crooked ray is the gold standard. Electric so called fields deflect in the same way as magnetic so called fields, but the travel path is distinguished. 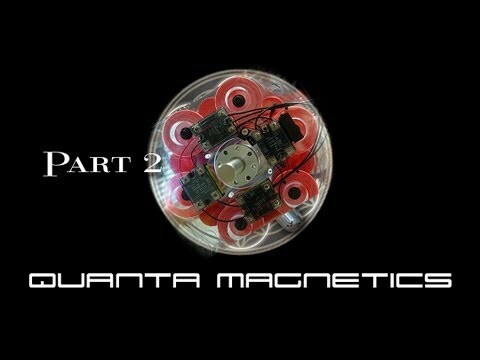 It is as if the electic field is a magnetic field between 2 orthogonally placed magnets and vice versa. If we imagine liness between capacitor plates we have to imagine orthogonal lines between magnetic centres. Instead imagine circular vortices between any opposing surfaces with axis parallel to the surface. The geometrical properties of ultra-low-frequency (ULF) waves in the magnetosphere originate primarily from constraints imposed by the ambient medium. Since long-period ULF waves span global dimensions, the normal modes are constrained in spatial extent by structures that define the magnetosphere---the magnetopause, magnetotail, plasmapause and ionosphere. ULF wave characteristics also vary continuously throughout the magnetosphere because the geomagnetic field and magnetospheric plasma are strongly inhomogeneous on the length scales of long-period waves. Inhomogeneity limits the accessibility of some ULF waves in particular regions of the magnetosphere. These constraints enter all realistic descriptions of ULF wave propagation, and, together with a physical model for propagation, they suggest some optimal choices for geometrical representation of the wave fields. The physics of magnetospheric ULF waves, including dynamics, mode coupling and interactions with various boundaries, are described under a wide variety of conditions by the equations of one-fluid magnetohydrodynamics (MHD) [cf. Southwood and Hughes, 1983; Samson, 1991]. An important property of the MHD theory, that bodes for the choice of geometry, is its prediction of strongly anisotropic behavior. MHD electric fields are locally orthogonal to the magnetic field in the one-fluid theory, and the propagation of two of the three basic MHD modes---the slow magnetosonic wave and the shear wave---exhibit magnetic guidance, whereas the fast magnetosonic wave alone exhibits a more isotropic propagation. The fact that the magnetic lines of force place strong dynamical constraints on MHD characteristics is a compelling incentive to analyze magnetospheric ULF wave properties in a geometry defined by the geomagnetic field, comprised of the internal field of the earth and persistent external deformations attributed to large-scale magnetospheric current systems [ Stern, 1994]. In space no one can hear you scream! On earth or locally magnetic fields are said to be locally orthogonal. But in space, or large distances or spacetime they are allowed to curve into parallel streams. A fluid dynamic model is used.mthe only constant is coupling in alignment. Simply coupling means how they drag or friction against each other! If the " magnetic' is parallel with the " electric" there is no coupling! That is they flow in a stream together! Usually, the story goes an orthogonal component messes things up! Really? Where do these orthogonal components come from? Pragmatically our model of electric and magnetic is confused and confusing. My solution is one phenomenon that is vorticular. Triboelectric series are what i have been searching for. I did an experiment with an active pen on a compass needle inside a fluid medium and the active pen attracted the needle to it whichever end i went. Now this could be seen as paramagnetism, except that the weak magnetic state of the needle reasserted itself when the active pen was removed. I have hypothesised that magnetic action is present throughout a region or volume of space, whereas electric action is localised to surfaces of volumes or regions. This sharp separation on the surface of a volume may be underpinned by some fractal dynamic internally, but more empirical data is needed. The neat categories we are taught seem to be rules of thumb. As a rule of thumb magnetic action is different to electric action but this is not very convincing. To establish this distinction it is falsely claimed that electric field lines begin and end on charges, while magnetic field lines do not! this of course is nonsense, but charges and anions and cations are part of the folklore. When you eliminate this distinction, the realisation is that we cannot tell which is which except relative to each other! What makes the distinction is not the effects but the circumstantial evidence. One set of circumstances we have called magnetic, the other electric. The variety in thoses circumstances are so great that it is not clearly stated that a selection has been made to establish the distinctions! Comparing and contrasting reveal greater similarities than differences, but of course, this is not trumpeted for fear of losing valuable academic status or financial reward. Most of the electrostatic demonstrations that follow use an electrophorus for the supply of charge. Volta is generally credited with inventing the electrophorus perpetuum in 1775. Our modern version uses a sheet of Teflon for the dielectric plate which is charged by rubbing it with rabbit's fur. It was called perpetuum because the charge does not get used up (when charging by induction). A metal disk with an insulating handle is held over and close to the dielectric plate. The dielectric (negative in charge) repels the electrons from the lower surface of the disk to the top surface. These electrons are then allowed to escape by momentarily grounding the disk (by touching it with a finger). The disk with the remaining positive charge is then lifted away from the dielectric and this charge is used for the desired purpose. Any number of charges can be obtained from the electrophorous in this manner without depleting its charge. This is because work is done by the hand that lifts the disk against the attractive electrostatic force. The electrophorus will keep its charge for many months. Of course, if the metal disk is allowed to touch the dielectric, it will become charged by conduction (negatively) and this does deplete the charge of the electrophorus. This thread is about charging a Leyden jar using a magnet in this way. In stead of directly grounding the induced material is "grounded" through several strokes with a magnet. This resultant induced "magnetism" is what i want to compare in a leyden jar. So at last some evidence that powerful magnetic turbulence could charge a Leyden jar! This is a Leyden jar on a planetary scale! The magnetosphere captures the electric substances and wraps it round itself. It forms the conduction path for the electric substance. Ed's theory was that the 2 magnetic substances combine to form the electric current. The electric substances are distinguished by their behaviours relative to magnetic substances and vice versa. This dependant relationship means that to isolate one substance from the other is a false dichotomy. The difficulties we have in combining or distinguishing electric and magnetic substances is perceptual. When does an arc become a straight line? This is the sort of perceptual confusion we face with electric and magnetic behaviours. The description of these behaviours in fluid dynamical terminology is the best instinctive set of labels we have come up with so far. However, the single substance we may be envisioning has a single Neetonian metaphysical name and that is Motive. In everyday terms we my refer to it as pressure, but scientists have attempted to define its measure as Energy. While motive is the metaphysical , Newtonian source of acceleration, it is far more causative than that. The notion is indeed akin to the modern notion of Energy, but one has to carefully distinguish between a spaciometric( geometric) measure which is a proportional conception of a subjective concept and the concept itself. Motive as pressure and as energy lends itself to the behaviours of electric and magnetic substances in general and in particular.